AMCA Acid (7-amino-4-methylcoumarin-3-acetic acid) is one of the most popular blue fluorescent tagging molecules. 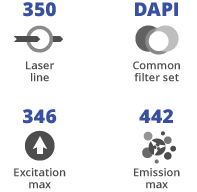 Often used as contrasting probes for double- and triple-labeling in immunofluorescence microscopy, arrays and in situ hybridization. 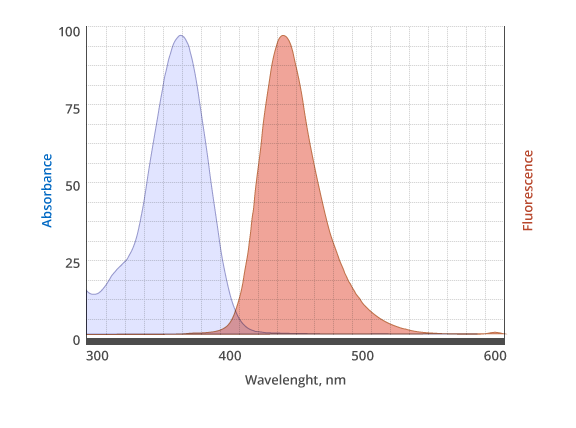 The desirable properties of AMCA dyes include a relatively large Stoke’s shift and resistance to photobleaching. AMCA Acid is a reagent of choice for the preparation of custom activated esters that often are not commercially available. Examples of such activated esters include sulfo-NHS, TFP (2,3,5,6-Tetrafluorophenol), STP (4-Sulfo-2,3,5,6-Tetrafluorophenol, Sodium Salt). Another common application for non-activated carboxylic acid is peptide modification during solid phase synthesis, which usually requires in-situ activation with peptide coupling regents, for example HATU. AMCA Acid is also often used for control experiments, and for calibration.